Just a little comment about pig feeding I have found helpful for me. When it comes to pig nutrition I just google “nutriton in…..”. The nice thing about it is that is the first link on the page after the advertisements. Zucchini raw is 18% protien and pretty balanced in protein and if you click the “see more” tab it will break it down into the main amino acids such as lysine and tryptopan. Also considering that zucchini is one of those veggies you can’t seem to give away why not plant a few extra plants for the pigs? You can also do the same thing with field peas, turnips ect. I can get about a thousand turnip seeds for about a buck. And turnip greens are another good source of protien. You can also feed them your pea vines, pea hulls, sweet potato vines, coolards,broccoili leaves, and I even have been known to feed them the weeds out of the garden. Since pigs are a lot like people I use the nutritional values that are posted for people as a guide for feeding the piggies. Very nice analysis! You must be a type A person:) I have to say I am disappointed with your conclusion about the effectiveness of feeding garden produce. We raised 4 hogs last year and intend to raise more again. I desperately want to get away from buying the hog feed that contains drugs and GMO products, but economically it is going to be very difficult to do. I was hoping to plant an extra large garden to help supplement their organic feed and extra milk from our cow. I sure wish the garden and eggs would have made more of a dent in your costs. I was wondering how long you kept the pigs before butchering. I am just curious how long you had to tend to them and feed them to come up with an almost 200 lb hanging weight. Thanks for the post. We kept them for 4 months: Sept 12 through Jan 15th. It’s on the full journal page. Well…its now February and I promised to update. I just sold all the babies from Shela and Pam and after all the cost except labor we made a whopping 140.69. But we still have two girls and the two Sows (Pam and Shela). I have some help coming over Saturday next and we are going to butcher our first hog at home. Here are some things I have learned that may help some. The first one is do not buy pig feed…buy cheap cattle feed instead. Then get a bag or two of soybean meal. You can google the Pearson Square and one website even has a converter that tells you how much soybean meal to add to any protein mix. A 14% protein is about four scoops of 14% and two scoops of 47% soybean meal. The cattle feed cost about 7.00 a bag and right now soybean meal is 16.25 for 50 lbs. I can get cattle feed in bulk for .13 cents a pound. I have yet to find bulk soy. I am still looking and still learning. The only problem with feeding soybean meal is that most soybean crops are GMO. I would look for a healthier alternative. I had a friend who bought some new garbage cans, took them to restaurants and fed pigs from this. But scraps from restaurants, zucchini and any number of squash. Yam and sweet potato, but those need to be cooked for pigs for some reason. My friend with restaurant scraps managed to raise 12 pigs for the price of the drive to town which he did on his way to and from work. So if you are totally in the boonies ignore this, but… This is a fabulous source of pig food. That is awesome. I actually work in a grocery store part time and I bet I could do the same. I am looking into getting a few pigs. Thanks so much for your post! Any idea how much she feed them from the restaurant food? Like pounds a day or something? Or did your friend just feed them as much as they would eat? The feeds you give your pigs also detumins flaver of the meat! The pigs that are feed a lot of left over human foods , do not taste as good as ones that ate fed a more natural diet !! Something we learned by feeding both ways and found foods from restaurant and such type places save on feed cost , but destroy meat quality!! As an owner of a slaughter house/meat processing facility I did take a bit of umbrage to your paragraph about the costs involved in butchering your animals. The costs of equipment needed to effectively slaughter and cut up livestock is staggering. The amount of knowledge one must possess in order to ensure this is done in a manner which protects the end use customer is something few understand. I do not recommend anyone butchering their own livestock without the knowledge of critical control points involved in assuring that they do not inadvertently endanger their family with tainted meat. I re-read my comments about meat processing and I don’t see what you took offense to. I admitted that “Butchering is a huge hurdle for the novice”, and I’m not suggesting that the local meat processor is rolling in profits. We considered doing it ourselves and decided it wasn’t worth the risk to our existing investment in the animals. An older neighbor gave us a hard time for hiring out the butchering, but a year later he also paid someone to process his pigs. Risks and complexity aside, it is a fact that paid butchering is a huge factor in the cost equation for home raised pork. There’s no getting around this. Economics of scale are just working against you. The inefficient costs of raising a couple animals are partly defrayed into your own time, but the inefficiencies of butchering just a couple animals are entirely represented by a dollar amount. Perhaps if people paid themselves for their time, they wouldn’t even raise the animals in the first place? It’s also not unreasonable to suggest that people can process their own meat with some basic training. There are classes on butchering held in many areas these days, not to mention books and YouTube videos. Our ancestors muddled through the process for millenniums without formal training, my grandparents turned a chicken into dinner every Sunday, and even today tens of thousands of hunters butcher deer in the middle of fields and forests. Denise, I have slaughtered pigs, sheep, goats, chickens, rabbits and deer at home and so far have produced excellent meat with no problems. I wasn’t raised to any of this. I learned from books and youtube and neighbors, and I believe this process is firmly within the grasp of the careful homesteader. That said, perhaps there’s something we home processors are missing? The critical control points I consider (not that I’ve written a HACCP plan) are time and temperature, animal stress, clean fast kill, cleanliness and disinfection of site, animal and tools (particularly during gut removal), as well as some basic analysis of muscle and organs for possible parasites or other issues. Granted, I don’t recommend anyone just grab a .22 and a knife and head out to do some butchering, but I think the quality of instruction available in the world is high, and a little research and care yields quality results. Curious as to why you chose to grow them out through the winter? I’m sure your feed conversion rate would have been better if they had not used so many calories staying warm? Also wondering how much pasture they had access to? Than you for all the charts and economic breakdown, it’s all very helpful. It just worked out that the fall season was more convenient for us. If I was doing my own butchering, I would always raise them in the fall so the weather would be in my favor. It’s a good point about feed conversion though from all the cold weather. They had very little pasture access. The pig pen was about 8000 sq. ft. and only half of it gets enough light for grass. For this breed, I don’t think additional pasture would have helped with the feed bill. They showed very little interest in grazing. Pigs are one of the next animals that will hopefully gracing our farm this spring. This post was very informative. Thank you for sharing! We just received out two piglets. Thank you for this blog. I was amazed at so many eggs! Was this purely for the protein and offset feed cost? Our chickens haven’t started laying yet, so should I be buying eggs? Also our garden is done until next year; should I be purchasing the other fresh goodies? We are out to buy five months of feed to store. Should I be looking at cattle feed instead of pig feed? I would encourage you to read the whole post, particularly the part about equivalent feed sources. Feeding eggs to pigs is a huge waste of time and resources, even if you are producing your own eggs. Similarly for most garden produce. There are a few types of produce that are a little more calorie efficient (as discussed in some of the comments), but in general it’s not practical. I have no experience with substituting cattle feed vs. pig feed. 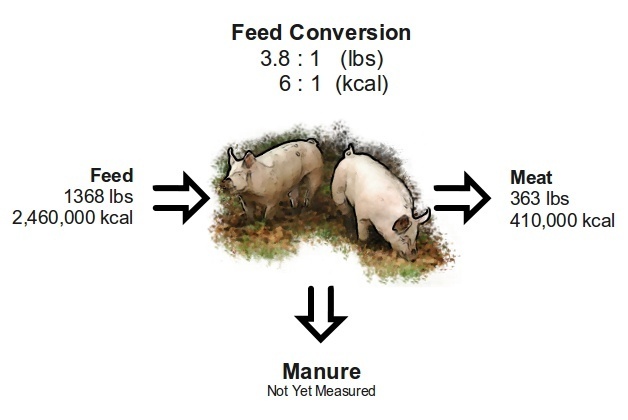 Pigs have very different nutritional requirements vs. ruminants, so I’d guess it is better to feed them something already balanced for their species. I called up a feed mill before we decided to use bagged food, and I remember that their chicken feed was almost identical to their pig feed blend. I live in warm state ,light winters this is second year for pigs last years pigs wieghed out almost same as yours with few lbs different.but they were15 months Since it was my first time with pigs ,when I got them I went with what the old farmer fed.1scoop scratch,1scoop cracked corn. I bought not1bag of hog feed the whole year!used horse wormer on them every other month will do the same with these girls .this way I know what they are getteing,they get eggs as treat . Whole eggs straight from coop! And kithchen ,garden scraps. No meat ever. Mine seem to do well on this diet same weight double the time more lean meat. How big is your scoop? LEE if I were to put the pig manure in with horse manure. And kept turning it over with bucket loader for a year. It turns out like pulverized dirt. Could I use this on my garden ? Sorry I’m so late in responding. I’m no expert on this, but I would think the compost you generated is pretty safe after a year. That’s around the time frame required for composting humanure, which poses more risk than pig manure. Incidentally, the big pile of pig manure I built was never turned over, but by the time we started digging into it two years later it looked completely like dirt. I am currently researching different farming practices and methods of raising my own food, including animals. I also happen to LOVE bacon and ham as well as pulled pork so pigs are a priority animal for me to raise. I found your post well written and informative. I do have a suggestion for you to research for yourself though and it would most likely reduce your costs overall. I personally don’t plan on buying feed for any of my livestock except maybe some hay for the winter. I have found the videos on the following links to be highly educational in my research. While I can’t yet afford to take the courses offered via this site, I’ve learned vast amounts just from watching the many videos offered as previews. It IS very possible to raise pigs with little to no financial input beyond weanlings, shelter and butchering. Remember, people were raising pigs long before there was commercial feed available. You could also look in Chris Selzer’s Agricultural Insights in regards to pasture management. He has a website and YouTube channel by this name. I’m looking forward to putting what I’ve learned into practice next year. I think the value of the animal products (dairy,egg, etc)is they contain lysine, which is no doubt provided for in a “complete ration product” but unavailable on pasture.The Sugar Mountain Farm sight delves into suprising detail regarding thier feeding practices, which is entirely pasture based.Thanks for a very informative post, the processing graphs were especially revealing. Sounds like u did great to me, hope i do as well in my first foray into pigdom! Maybe the one lady should look into the advisability of purchasing 5 months worth of feed though? I’m not sure at what stage in the process you think pigs should cost $200. I frequently see piglets for $200 around here on Craigslist. My family has dramatic success raising pigs for personal consumption. Our own sow, we have a commercial farmer lend us a boar that is particularly frisky. Grain is grown on our land(not enough to be commercial, and generally I do the slaughtering myself. We have 5 pigs, and they eat the “garbage” produce a grocery store will throw out. The staff is happy I pick it up, otherwise they would have to chuck it in the dumpster! I supplement that with some grain and hay (which I traded for) . So far I have zero in feed costs, just the time to go pick up the free feed. We butchered one and have 3 feeders, a sow and a recently added Berkshire boar. This sounds like an excellent use for pigs. They make perfect recyclers and your costs will be very low if you can continue to use waste streams as the primary food source. It’s unfortunate that pigs are not used in this manner in general. We are just beginning to raise pigs and need advise as to what to store the pig manure in after you shovel it up ,really need to keep the smell down to avoid complaints from my neighbors. Any suggestions ? We raised ours from late summer to midwinter, so there really wasn’t much smell. The manure piles got bigger as the temperature got colder, so it was only occasionally noticeable from the house. This is a biased estimate. First, most places you can butcher your own meat, so that $350 ends up more like $35. Second, you don’t need commercial products to feed pigs. If you take the time to find out how to do things for yourself your costs will be less than half of those estimated here. It’s not biased. It accurately reports our costs. Your mileage may vary. If you had read the whole post, you would have seen that I mentioned the potential cost savings of home butchering and alternate feed sources. Not everybody can find free food sources in their area nor do they want to dive straight into home butchering. If you plan to sell the meat then most states require it comes from a licensed butcher. Thanks for your informative article, Lee. For me, raising my own pigs is not about saving money. I’vé purchased pork on sale for .99/lb and it still isn’t worth it- it has NO flavor. It is beyond bland. No flavor means less nutrition, too, in most cases. Producing really good pork means starting with the right genetics (often heritage breeds or crosses) and the best diet you can give them. That is where the “seasonings” come into play. The fruits, vegetables, grass, weeds, nuts, sod and so on provide vitamins, minerals, omega 3, cla’s, and je ne sais quoi crucial to developing their full flavor potential. I (selectively) source a lot of free scraps, too, but aim to replicate a diverse healthy human diet. The butchering costs can vary regionally. USDA is a lot more $$ and not necessary for home consumption, imo. My local state inspected butcher runs a spotless operation. I admire those who do their own. I watched a Burmese family do it on my farm. It just takes care and a lot of effort. A good thermometer when cooking any meat is your best defense, regardless. I still remember the first time we raised our own chickens and pigs for meat at age ten. It was that good. The giant chicken legs and thighs, homemade sausage and scrapple. I never forgot it, and that was forty years ago. THAT is why I recommend others raise their own meat. And if you are resourceful, savvy, and use everything but the squeel, it is competitive with the grocery in price and a home run in terms of quality. And the memories? Priceless. I was stopped on the street once: “I remember you. You sold me the best chicken I’vé ever had.” I hope you give pigs another try sometime, Lee. And maybe chickens, too!